The Raven and I were all set to ride Steph's horse and my pal Jose Viola in the 5-day Owyhee Canyonlands, when, right before the ride, a bad attack of allergies knocked Jose out, which sort of knocked the wind out of my sails. I was the lethargic one, somewhat uninterested in riding (really?? me?? 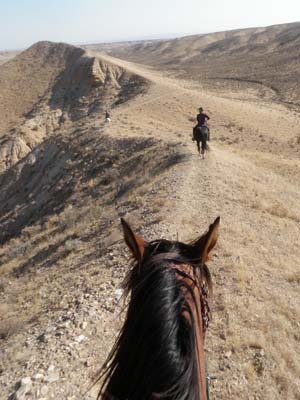 ), but thanks to our friend Judy, who offered me one of her horses, and convinced me to get in the saddle, on Day 1 I rode one of the most spectacular trails here in Owyhee that I've ever been on! where owner Don opened his lodge and supplied cold drinks and hot dogs for everybody in the spectacular remote setting along Castle Creek. The vets and a few of the early riders caught sight of the herd of some 11 big horn sheep that live in that drainage. It was a tough ride, crossing several of our big canyons - Brown's Creek, Castle Creek, Hart Creek, and our home Pickett Creek. A spectacular day of trails, great weather - a bit of rain the day before the ride damped down the dust and got rid of the smoke - and a good ride on a lovely horse, made for a great day 1 of the 10th anniversary of the Owyhee Canyonlands. 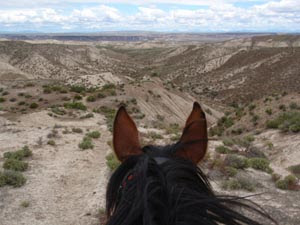 Can you stand one more preview video of the upcoming Owyhee Canyonlands 5-day endurance ride, Sept 25-29? Good! These are some of the trails you'll ride on Day 4, heading north of the highway toward the Snake River and Wildhorse Butte. Jose knows how to fly along the trails in style! more videos and photos here! You'll ride this Hart Creek Rim Trail at least once on the Owyhee Canyonlands 5-day Pioneer ride. Jose and I had a blast cruising along it, making this video! A video preview of the Hart Creek Canyon trail, Day 2 of the Owyhee Canyonlands endurance ride, September 25-29 in Idaho. A video preview of the Sinker Canyon trail, Day 5 of the Owyhee Canyonlands endurance ride, September 25-29 in Idaho.